Do Neighborhoods Spread? | Econsult Solutions, Inc. Growing up White in West Philly, I thought a lot about neighborhood boundaries. Somehow, despite “West Philadelphia” being predominantly Black, my block at 47th Street was entirely White. To the east, towards Penn and Drexel and Center City, lay more blocks like my own, filled with predominantly White households. Immediately past 49th Street to the West, though, the demographics shifted, with those blocks composed of entirely Black households. 49th Street served as the boundary between the two neighborhoods. It wasn’t an official boundary, not on any map, but it had emerged from the sorting of household moves and residents’ use of space. The neighborhood has changed in the last 30 years. Signs of gentrification now pepper Baltimore Ave, from a brew pub to a yoga studio to, most recently, a baby clothing store. As the neighborhood changed, the population changed in a very specific way. That boundary between White and Black households, which used to lie on 49th Street, moved. The boundary now, by various accounts, has reached 51st. 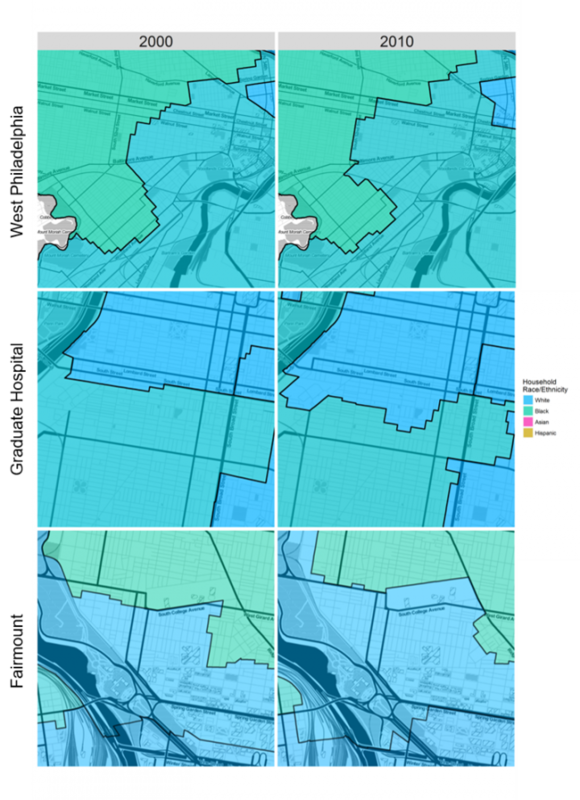 The arriving White households aren’t moving in gradually and uniformly across West Philadelphia, but instead are moving in just on the other side of the boundary, flipping whole blocks from nearly entirely Black to nearly entirely White, as the White region spreads in space. Neighborhood change researchers rarely use models capable of the notion of neighborhoods spreading. Instead, we download data in Census Tracts, and compare those tracts’ populations across time. In doing so, we miss an important feature of how and why gentrification is happening. In forthcoming research, I develop a method to quantify boundary movements and their contribution to demographic change. 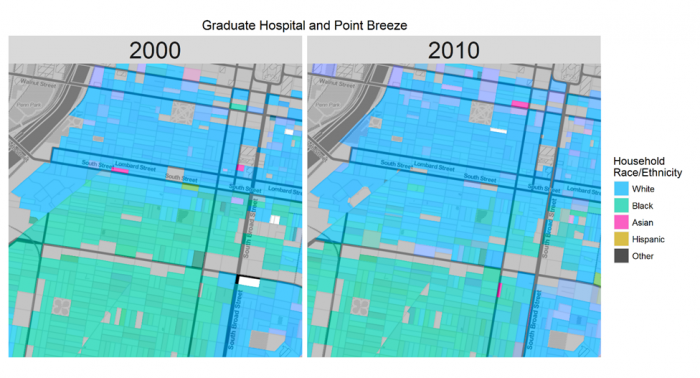 In this post, I rely on maps of Philadelphia to tell the same story. What we see in all of these maps, and consistently across the city, is that gentrification did not happen by gradual demographic changes in blocks. Neighborhoods didn’t change by an 80% Black region becoming 75% Black, and then 70%. Instead, gentrification occurred by regions of all-White blocks expanding, dichotomously switching the blocks over which the boundary passes. To quantify this, I develop a Bayesian spatiotemporal clustering algorithm to identify these clusters and their movement. This algorithm identifies the clusters readily visible on the map, and draws the lines between them. This allows us to quantify those boundaries’ movements. Figure 5 shows the resulting clusters for the three neighborhoods above. In each, we see a clear boundary moving as the Whiter cluster expands into the Blacker one. How is it possible that the city became less White over the decade if the White clusters are expanding spatially? Clusters are internally becoming less White, and more Hispanic, Asian, and Black. Gentrification specifically occurs by spatial expansion, as the increases in these other groups which actually dominate the city’s overall demographics occur by clusters’ internal changes (the internal colors of the clusters are gradually changing). What does this all mean for neighborhood change? There are two important implications for how we conceptualize gentrification. The spatial targeting of investments is important to city management. We often build a supermarket or beautify a park with hopes of either avoiding demographic change—so current residents can reap the rewards—or instigating it—so local investments can have multiplier effects. Investments that are far from a boundary won’t trigger demographic change, while investments right along the boundary likely will. Boundary movements imply a very specific model of how gentrifiers choose a house: they want to live in the already-gentrified cluster, but move in just on the other side to exploit the not-yet-gentrified prices. What will happen when they do? Likely, their days will be spent in the White cluster—that’s where they will shop, will eat, will walk. Sociologists call this “activity space”. Why else prefer to live on the boundary, rather than in the heart of the cluster, where rents are presumably even cheaper? The segregation of poverty has damaging effects for residents and society. Therefore, we might guess that gentrification, by increasing White populations in predominantly Black neighborhoods, should have positive desegregatory effects. But boundary movements mean that the blocks themselves are not desegregating, but rather mostly-Black blocks are switching to mostly-White blocks. While tract aggregates might show declines in segregation, blocks would belie this. Further, the segregation of activity space will be even starker. The sharpness of these boundaries suggests that they matter to residents, and a likely implication is that they will segregate their lives accordingly. When neighborhood change then proceeds by moving boundaries, residents will expand and contract their use of space to correspond to the new boundaries, and activity space segregation will have zero change. 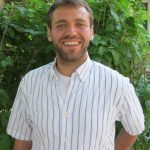 This research represents a first step into measuring the fine-scale spatial change of neighborhoods. There are many questions left open. How do these boundaries constrain residents’ use of space? How do other variables interact with these boundaries? What is causing where and when they move? Recognizing that boundaries do move, and specifically so for gentrification, makes possible a new understanding of how neighborhood change happens, and what it means. 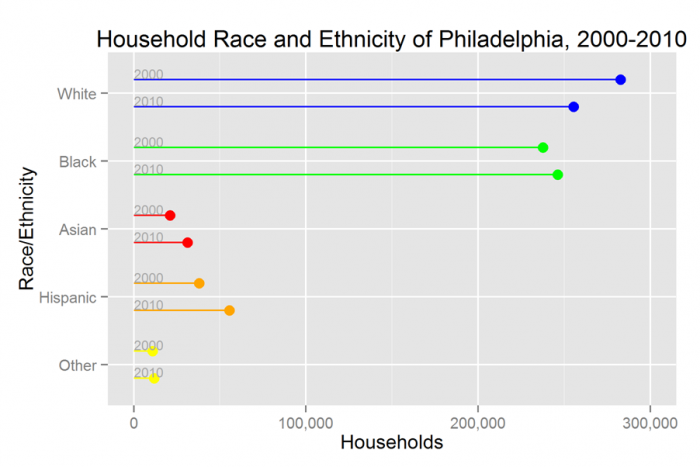 This post relies entirely on Census household race and ethnicity data. Gentrification is typically defined by increases in wealth and property values, so the equation of racial change and gentrification isn’t perfect. However, in cities like Philadelphia, gentrification and increasing White populations go hand in hand, and it is often the racial dynamics of gentrification that causes tensions and concern. Moving forward, I use gentrification to mean increasing proportion-White. Be forewarned.